If you’re a shopaholic and there’s just no saving you, then you’ve got to at least be wise about it. Avail of membership or rewards cards and look out for special promos so that you get to shop more with less guilt. Trust me, I should know. I belong to a family of master shoppers so I’ve been trained well. And because shopaholics like us need all the help we can get, I’ll gladly share my intel with you. You’re welcome. I’ve talked about the perks of having membership/rewards cards in one of my older posts so I’m sure you already know all about them. But if you need a little reminding (which is code for “you didn’t read my post”), it’s basically more promos, more points, more shopping! Case in point? It’s only February and there’s already an exciting promo waiting for SM Advantage, SM Prestige, BDO Rewards and Primo cardholders! 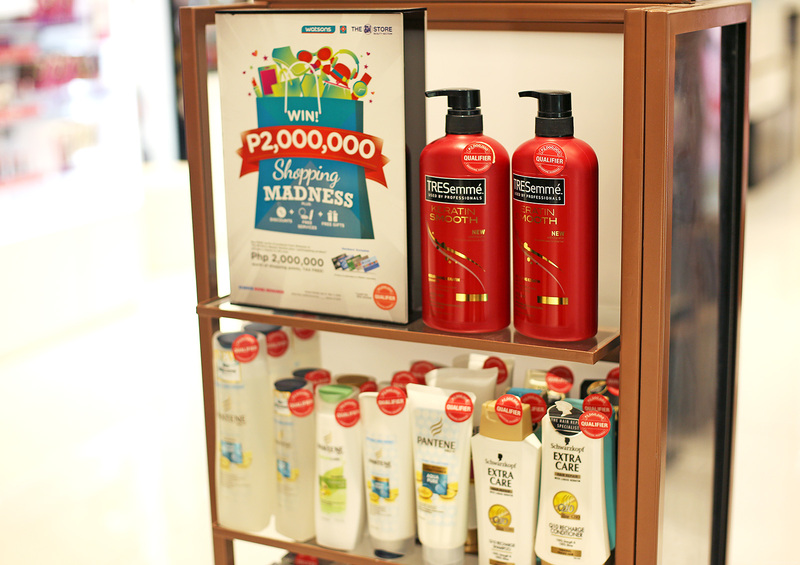 From now until March 7, Watsons and the SM Store Beauty Section are offering shoppers reasons to go “mad” with their shopping with its Shopping Madness promo! 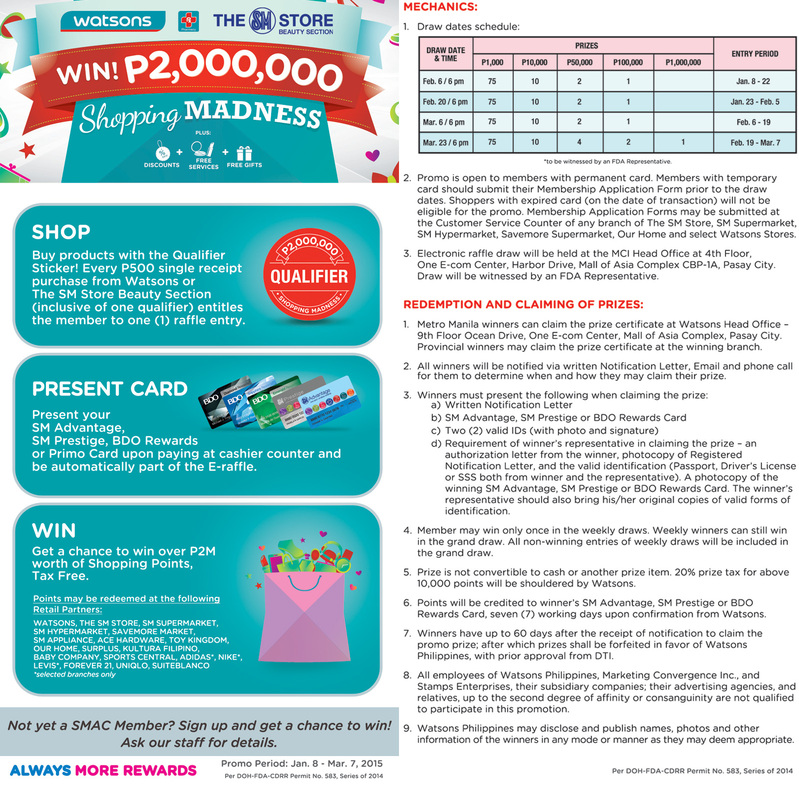 Shoppers with SM Advantage, SM Prestige, BDO Rewards or Primo Cards have a chance to win over 2M worth of shopping points, tax free! These points can be redeemed at Watsons, The SM Store, SM Supermarket, SM Hypermarket, Savemore Market, SM Appliance, ACE Hardware, Toy Kingdom, Our Home, Surplus, Kultura Filipino, Baby Company, Sports Central, Adidas*, Nike*, Levis*, Forever 21, Uniqlo and Suiteblanco. (*select branches only). So simply put, that’s a free two million peso-worth shopping spree for you! MADNESSSSSSS! To join the promo, all you have to do is buy products that have the Qualifier sticker on them like the the products in these photos. Every P500 single receipt purchase from Watsons or The SM Store Beauty Section (inclusive of one qualifier) entitles the member to one (1) raffle entry. Just present your SM Advantage, SM Prestige, BDO Rewards or Primo Card upon paying at the cashier counter to be automatically part of the E-Raffle. 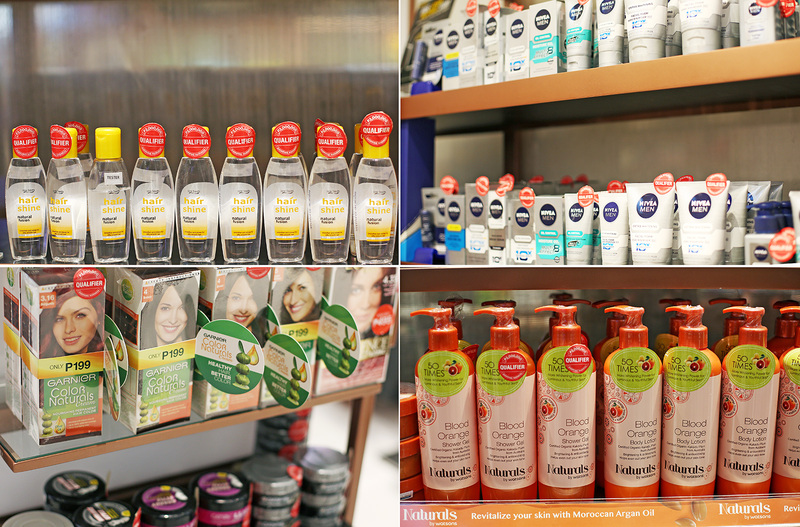 These are just some of the awesome products included in the promo, namely Pond’s, Olay, Tresemme, Pantene, Nivea, Gatsby, Belo, Maybelline and more! So of course, I got a few of the products with the Qualifier sticker on them when I shopped at The SM Store Beauty Section last week. Who knows, I just might win! And since I still have a lot of points in my SM Prestige card, I used it to pay for my purchases too! What did I tell you? I got to shop more with my points, without the guilt! So what are you waiting for? 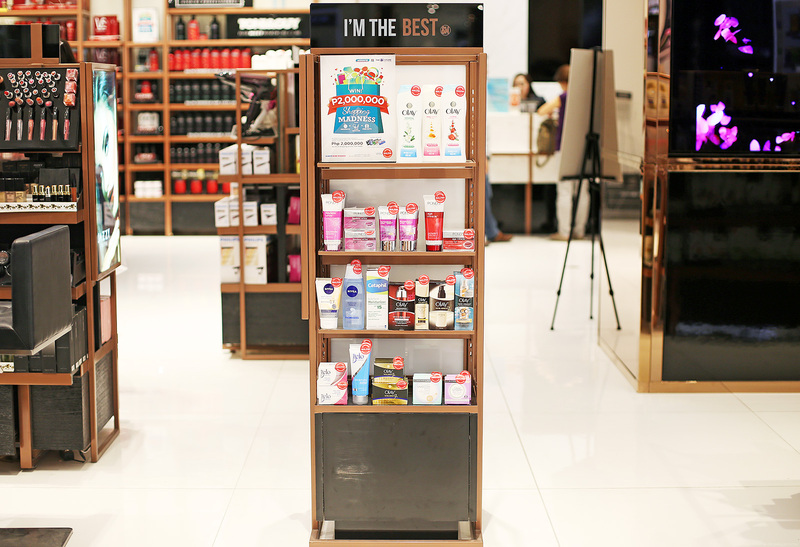 If you want to be a SM Advantage Card member and earn points as well, you can get your SMAC kit at any Watsons Store and track your points online at www.smadvantage.com.ph. Then join the Shopping Madness promo too! Haha so you understand me well! Thanks for this info Camille. I’ll surely join hahah! I joined last time, the Watson’s raffle for a million, but I didn’t win. I also joined the SM promo for Condo but still I didn’t win. Hope I’ll win this time. I’m addicted to joining raffles, promos etc. I’m happy to join these types of thingy because I’m just buying the things I need in a bulk and I get a chance to win prizes. I’m so kuripot pinay and so I only buy things I need and happy to get things I want for free! lol. And that’s one of the perks of being a shopaholic, the more you shop the more freebies and points! I bet you have thousands of points Miss Camille :) How about shopping online like in romwe or sheinside? Do they also offer discounts for regular shoppers? “I belong to a family of master shoppers.” This cracked me up! So do I! Hahaha. Love your personality! It’s something I’m proud of hahaha! :) We’ve been trained well my friend!